Thermoplastic polyolefin (TPO) single-ply roofing membranes are among the fastest growing commercial roofing products and have gained broad industry acceptance for their many performance and installation advantages. Suitable for a variety of low slope commercial roofing applications, TPO is a sustainable roofing solution for a wide range of building types. 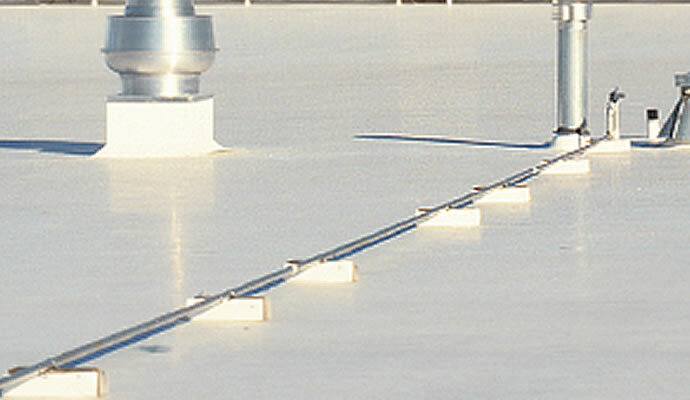 As demand increases for heat-reflective and energy efficient roofing systems, TPO single-ply roofing membranes continue to provide exceptional resistance to ultraviolet, ozone and chemical exposure. mechanically fastened, fully adhered, and ballasted. leaks. However, unlike BUR and Modified roofs, TPO will withstand grease, standing water, and UV rays. Depending on the thickness of the TPO membrane, insulation layers, deck type, and installation method, TPO warranties range from 10 years to 30 years; Call us for Warranty details.